Mihaly Csikszentmihalyi has studied the psychology of intense concentration into challenging tasks and related feelings. His work does not provide all solutions that a student of player experiences requires, but is central reading nevertheless. Many of the early critical works of digital game studies have been authored by games industry professionals, rather than academics. Chris Crawford published this classic text originally in 1982, and it has then been made available online by professor Sue Peabody from Washington State University Vancouver. 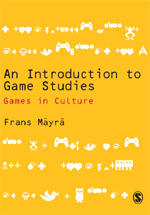 The book has been very influential in the way it discusses games through comparisons to some neighboring cultural forms. There is a continuing need to clarify the concepts used within game studies, and defining ‘game’ is one of continuing interest. This article by game designer and critic Greg Costikyan is interesting in the way it discusses the process of constructing the definition it puts forward. The original version was published in 1994 in Interactive Fantasy #2, the revised version in CGDC conference proceedings in 2002. There are various sources of Internet usage statistics — one of the most easily accessible (but maybe not necessarily the most reliable) is this site, Internet World Stats. As all digital games — not only virtual role-playing worlds — are increasingly transforming into online services, it becomes increasingly important for game studies to follow what is taking place in the use of Internet.